Patients undergoing paraesophageal hernia repair are known to have recurrence rates as high as 40 %. Preoperative findings on anatomic studies fail to determine intraoperative strategies to decrease this recurrence rate. Current operative techniques to reduce this rate include extensive mediastinal dissection to increase intra-abdominal esophageal length, closure of the hiatus with mesh, sac excision and gastropexy. The aim of this study is to evaluate the effectiveness of intra-operative strategies in decreasing recurrences. 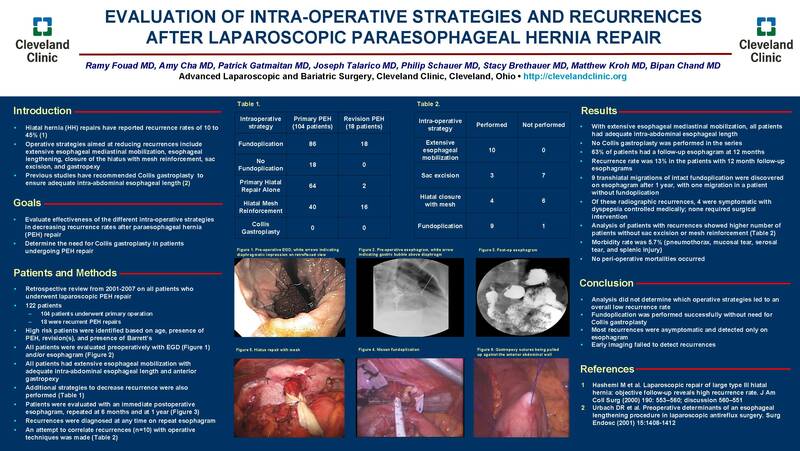 A retrospective review was conducted from 2001-2007 on patients who underwent laparoscopic Para-esophageal hernia repair as either a primary operation or revision. All patients were evaluated with either esophagogastroduodenoscopy or upper GI or both pre-operatively. Intra-operative evaluation of esophageal length after extensive esophageal mobilization dictated if a fundoplication was performed. Patients were grouped according to primary procedure or revision and then compared to each other. An attempt to identify reasons for recurrences was based on operative techniques. Recurrences were diagnosed with post-operative esophagram. 122 patients were included, 104 were primary operations and 18 were revisions. There were no mortalities and intra-operative morbidity rate was 5.7%. All revisional operations had at least a fundoplication performed. Of patients undergoing primary operations, 86 underwent a fundoplication, 28 of them also had the hiatus reinforced with a prosthetic mesh. Of the remaining 18 patients without fundoplication, 12 had mesh repairs. All patients underwent anterior gastropexy. Esophagram performed prior to discharge showed no immediate recurrence and 3 esophageal perforations. Follow-up esophagrams were obtained in 63% of patients at an average of 12 of months post-operatively. Only 10 recurrences were documented, all of which were discovered after 12 months. No recurrences were seen at the 6 month esophagrams. Of these radiographic recurrences, 6 were symptomatic. Of the recurrences 2 occurred after revisional procedures. Analysis of intra-operative strategies including mesh reinforcement, sac excision, gastropexy or fundoplication did not predict recurrences. None of the patients with recurrences underwent further surgical intervention. Analysis did not determine which operative strategies lead to our overall decreased recurrence rate. Recurrences on esophagram were not seen on the immediate post-operative period and remained asymptomatic in some.